Nearly every high school in the United States features a band room; a room where students gather to play instruments and share their love of music. For many, the band room is not just a normal classroom but a second home. 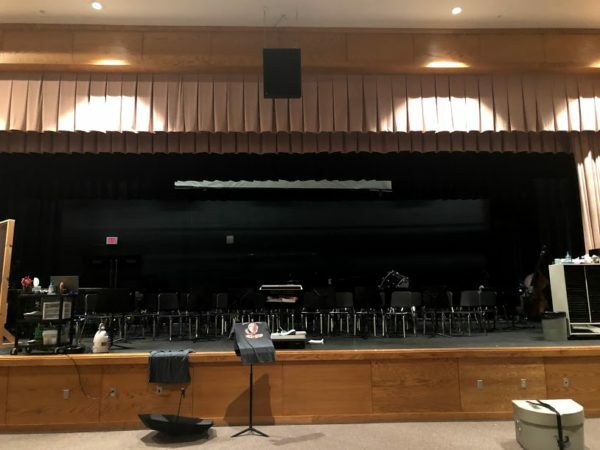 However, at Southmoreland High School, music classes are not held in the band room, they are held on stage in the auditorium. 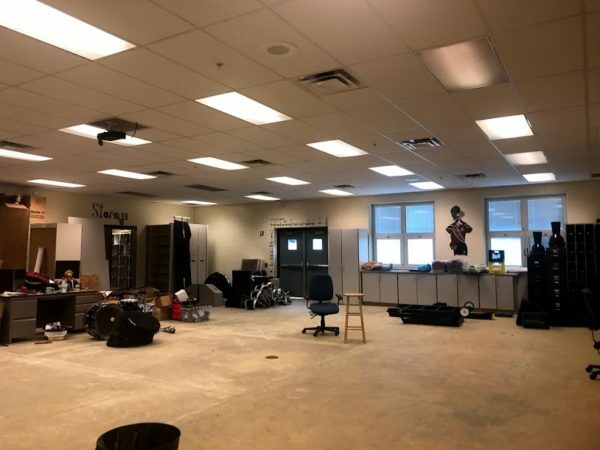 Everything one would normally find in a band room now sits on the stage – music stands, chairs, music folder shelves, a podium, a whiteboard, and even band director Mrs. Jamie Gore’s desk. Mrs. Gore and band students were faced at beginning of the school year with their room being quarantined due to “possible mold or mildew” as reported by superintendent of Southmoreland School District Mr. Vince Mascia. This led to students at the high school missing two days during the first week of school. More information can be found in earlier Tam O’Shanter coverage. The missed days of school may have been the end of average students’ troubles, but this was only the beginning of the music students’ problems. When one of the companies hired by the district, Intertek Professional Service Industries, Inc. (PSI), came to inspect and clean out the substance, it was decided that to further insure the safety of the students that the carpeting and ceiling tiles of both the band and chorus rooms had to be replaced. With no set date to return to the music rooms, the district received 3 bids to replace the carpeting in the band room. At the school board meeting on November 11, the board approved to pay for the carpet replacements in both the band and chorus rooms. After hearing of this news, Mrs. Gore was “overwhelmed” at the state of the band room. Until the carpeting is installed, Mrs. Gore’s classes will be held onstage. Using the stage for rehearsal is sometimes difficult due to it being a shared space in the school. With needs such as district-wide band and chorus concerts and musical auditions, it is a challenge for band classes to even be held. The set up of the stage-turned-classroom is a challenge as well. Mrs. Gore is now hoping to be back in the band room by January.